December is the best time to sum up everything that's been achieved and to plan ahead for the next year. Please allow me to share some of our favorite projects that Mindful Design Consulting had the pleasure to work on in 2011. 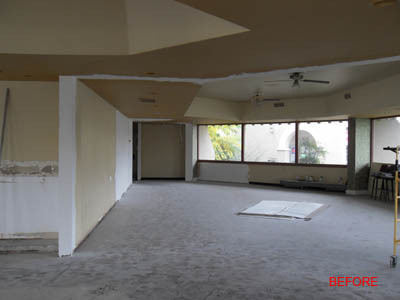 As usual, you will see the after and then the before images of some projects as well as design proposal drawings. In our Green News corner, take a look at a couple of great holiday gift ideas for nature lovers. Happy Holidays everyone and let's make 2012 a year of Our Dreams Coming True! In 2012 Mindful Design Consulting is getting ready to celebrate its 4th year in business. It was a challenging beginning but it was all worth it! 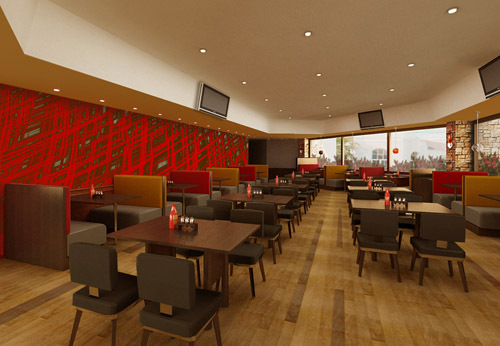 Today our website has become one of the most visited sites for commercial interior designers. Our traffic averages around 10,000 new visitors a month thanks to Digithrive! And about 40% of our clients come to us through the internet from all around the globe! If you would like to share a story of your business on our blog pages, please e-mail us and we will blog about you for free, as a small thank you gift this year! One of the most incredible projects we had a chance to work on this year is the remodel of this 3-story mixed use building for the new owner, a world renowned artist Daniel Merriam. It was an exciting opportunity to work next to a talented artist and to follow his vision for the "Bubble Street" gallery on the waterfront of Sausalito, CA. 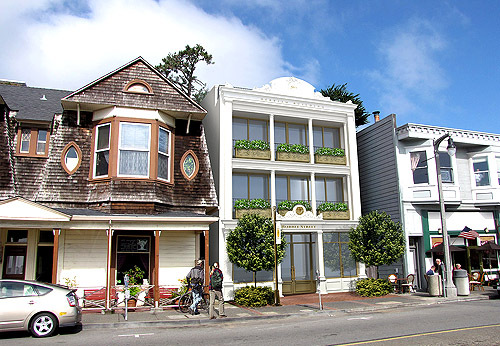 These are two renderings of the new design for the building facade on 565 Bridgeway, Sausalito, CA. As you can see on the BEFORE image below, the existing brick facade (circa 1981 building) was completely redesigned to illustrate Daniel Merriam's artistic style. Additionally the new facade will enhance the historical waterfront of the world famous Sausalito. Daniel Merriam personally provided hand drawn details of the building's elements (see the image below) as we worked on the construction documents for 2 different building permits. 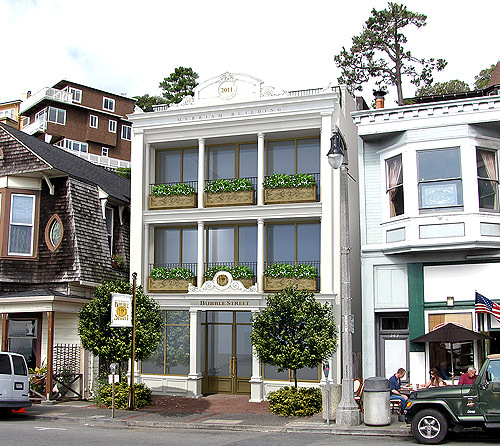 The facade went through a rigorous design review process and the approval by the Sausalito Planning Commission in collaboration with the local Sausalito architect Michael Rex. Currently the building is under renovation. Planter detail - drawing by Daniel Merriam. The interior retrofitting of the Bubble Street gallery is almost finished and the facade will be completed in the first half of 2012. 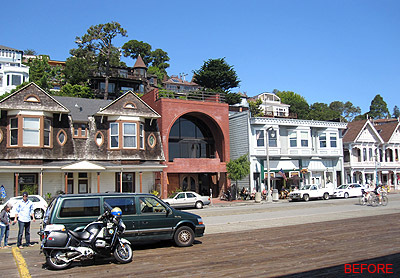 If you are planning to be in San Francisco next year, please visit Sausalito and tell us what you think. Crown Buffet is a new restaurant buffet style where you can satisfy most food cravings. Crown Buffet offers food from America, Mexico, China, Japan, Italy, Armenia and Russia! It's a family-oriented restaurant and required an appropriate style for all of the above factors. Mindful Design consulted on the overall branded look for the restaurant. Initial design rendering of a dining room, by Mindful Design Consulting. Warm bright colors were proposed to create a cheerful and at the same time internationally appealing style for the dinery. Mindful Design Consulting helps businesses with office branding and interior remodeling drawings. 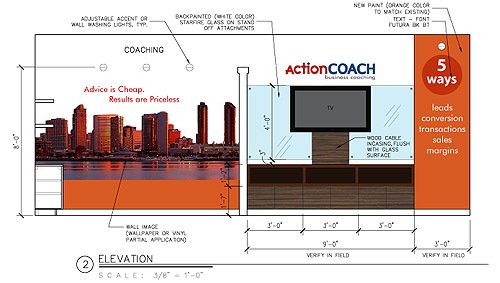 A new office for Action Coach needed a fresh identity. We worked together with Stacey and Chris McKibbin to add their personal touch to this business coaching space. We tried to create a fun educational environment for their clients. This was an inspiring little project! Thank you Stacey and Chris at Action Coach! 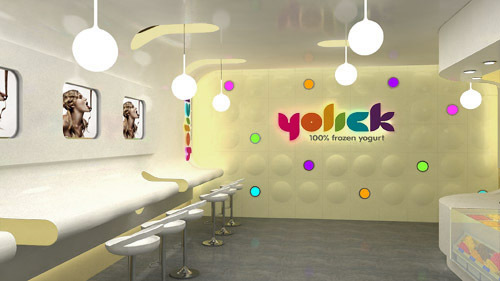 This yogurt shop in Shanghai desperately needed a new branding image to transform the interior. Our client wanted something distinctive to attract attention in several locations around the city. We created a sweet creamy feel with the flowing shapes of the walls, ceiling and even the counters. We picked banana yellow colors for the overall theme to add joyful feelings to otherwise white store. 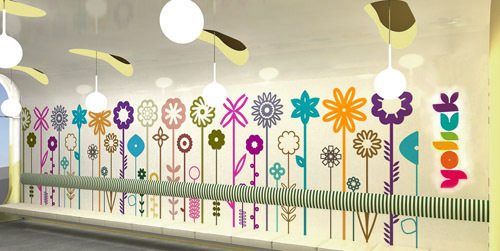 To add even more fun we applied images of geometric colorful flowers on acrylic wall panels. 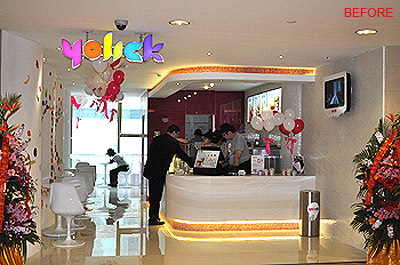 On the image below you can see one of the small locations of Yolick in Shanghai before our redesign. This year we've completed a few exciting residential projects as well. We would like to give special thanks to everyone who loves our style and who wanted to work with Mindful Design Consulting simply because you enjoy our creativity. 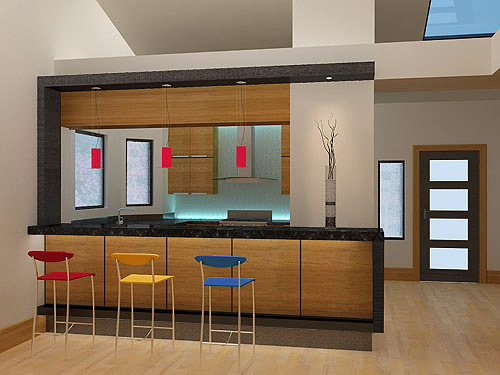 Proposed kitchen design on the image above. 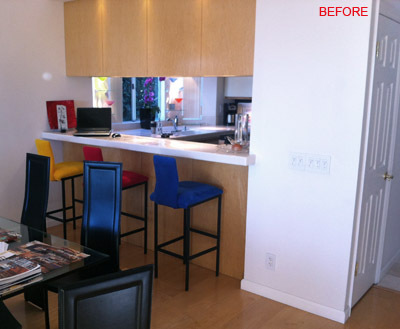 Redesign of John Brophy's kitchen in Carlsbad, CA. You can see a proposed black granite counter, two different types of wood on cabinets (Asian Cherry Straight Grain and Grey Oak for trim, Treefrog Veneer), steel base at the counter, LED strip lighting below the counter and on the glass backsplash. Are you think about making architectural changes in your business or home? Contact us HERE! Ready to take it to the next level with solar power? Give a gift that keeps on giving! These little solar powered lights are perfect for decorating your yard and are a huge help when there is another power outage in San Diego! 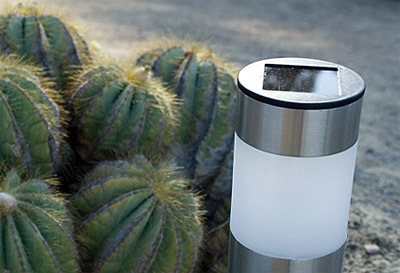 You can find these and other fun solar powered lights HERE. When you purchase a new plant for your office or home, you are suddenly faced with the dilemma of purchasing an expensive pot that will compliment the office decor without going over budget. Ceramic pots can be too pricey and trying finding the perfect fit may be too time consuming. The patent pending QwinQwin treeHUGGER offers the perfect solution to this problem! Read more HERE.